"Have you anything for Thanksgiving?" On the first Halloween in my new neighborhood this year, my street bustled with costumed ragamuffins going door-to-door asking, "Trick or treat?" One little girl asked for change for the homeless, promising that she would not keep it for herself. 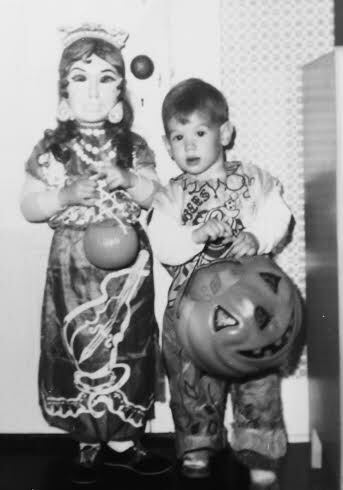 I recall "trick or treating" as a child in the 1960's, which often included asking for donations to UNICEF. This idea was inspired in the 1950's when a Philadelphia Sunday school class collected about $17 in donations as they went trick-or-treating as a means of children helping other children who were in need of more than candy. about until the mid 1940s. 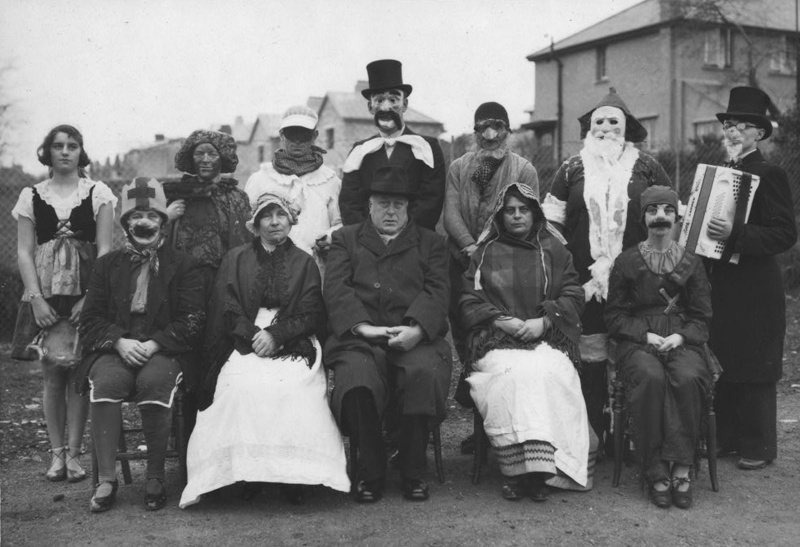 The festival of Halloween was brought from Northern Europe by immigrants. Originally it was more common in Maryland and the Southern colonies rather than New England. Generally it was a superstitious time where people would gather for parties, sometimes with the purpose of diving a future spouse for a young lady. 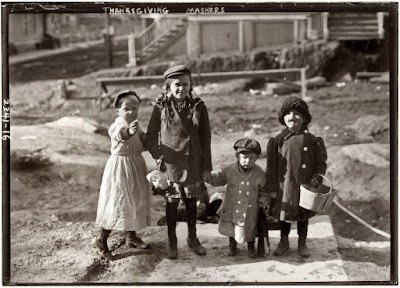 But before Halloween became an established American tradition around the time of WWII when costumed visitors would make their rounds, masked children went begging from door to door on Thanksgiving Day. Yes, sometimes history takes us by surprise and I had never heard of this strange, but true ritual. 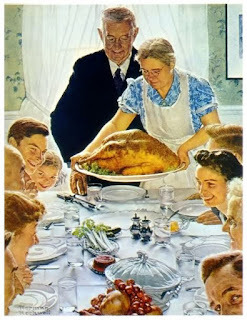 "Thanksgiving Maskers" would go about their neighborhoods in a similar manner as are modern day "trick-or-treaters" begging for a handout, "Anything for Thanksgiving." If they were fortunate, they might receive a piece of fruit, sweets, a penny or nickel, maybe even a potato or pie for the Thanksgiving meal. 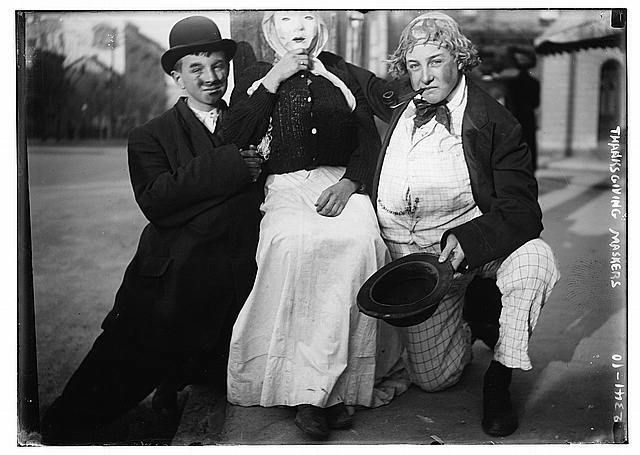 The tradition of “mumming” or “guising” (masked begging) has its roots in Northern Europe. 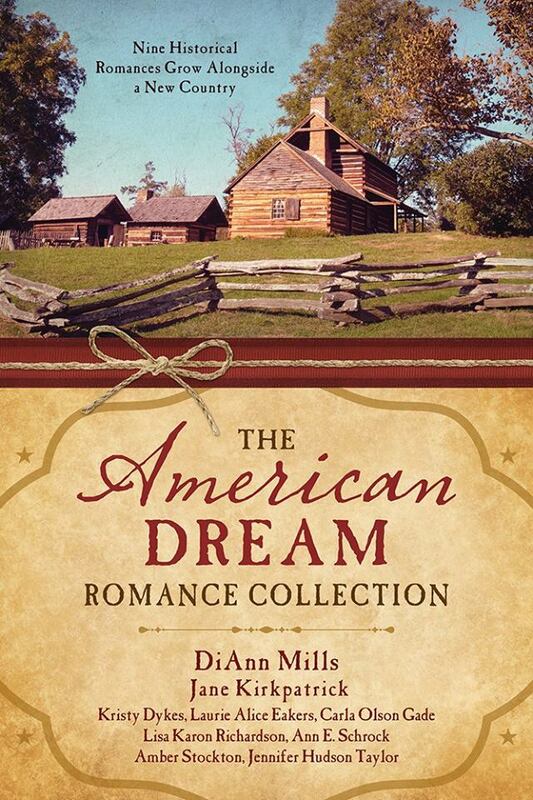 British, Dutch, Scottish, and Irish immigrants brought similar traditions of such to America. On Martinmas (Nov. 11), which honored the patron saint of beggars and the poor, St. Catherine’s Day (Nov. 25), Hallowmas (Nov. 1) when the poor would ask for food in exchange for prayers for the dead, and on Christmas (Dec. 25) or Boxing Day (Dec. 26) mummers dressed in peculiar costumes, sometimes made of straw, sang, danced, and acted out plays. Following Abraham Lincoln’s 1863 Thanksgiving Proclamation masquerade parties were often given for the holiday. It wasn’t long before Thanksgiving became a primary day for mumming in America. "Maskers" were seen alone, in groups, even parading in the streets. 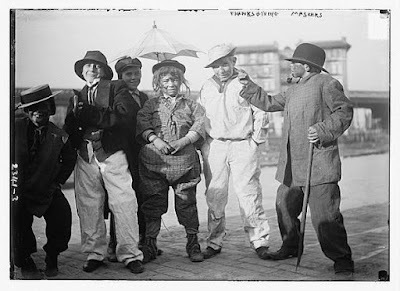 Before long, children were "mimicking the adult mummers. Soon it was referred to as "Ragamuffin Day." for manufacturers of and dealers in masks and false faces." As early as 1873 a book entitled Old New England Traits stated that in the early 19th century, poorer Massachusetts residents started knocking on doors on the holiday’s eve, begging, “Something for Thanksgiving?” As a prank, well-to-do children dressed in tattered clothes doing the same. The activity was participated by the people in New York, New Jersey, and Pennsylvania, though primarily in New York. In 1884 a man from New York recalled his childhood ragamuffin days when he would go out on the night before Thanksgiving and come home with potatoes, a tart, a pie for the morrow's feast. The melding of customs seems to have instituted the Thanksgiving parade. Since the 1780’s, New York’s Evacuation Day parade on November 25th commemorated the British evacuation of Manhattan at the end of the American Revolution. Bands of rambunctious masqueraders called “Fantasticals” dressed in garish costumes such as, politicians, harlequins, bandits, washerwomen, celebrities of the day, and veterans who donned the rags of Continental soldiers. 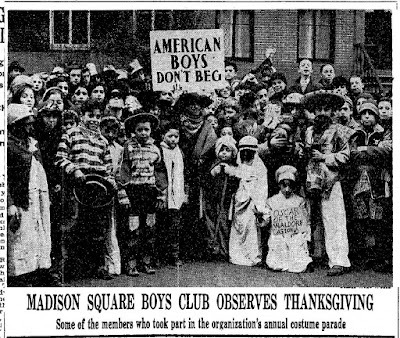 Following the Civil War, boys marched in on Thanksgiving Day in “Arm-in-Arm” clubs. Drunken men and boys and other rowdies went from house to house demanding to be treated. The “Fantastics” disappeared by about 1910. Children followed suit in their own Ragamuffin parades. Some dressed in more elaborate costumes as well as tattered ones with gauze “dough face” masks. The ragamuffins were often seen as a nuisance, especially by polite society who feared that children would grow up learning to beg and steal. Some cruel folks, would toss them "red pennies," heated so that they would blister the little beggars fingers when they picked them up. 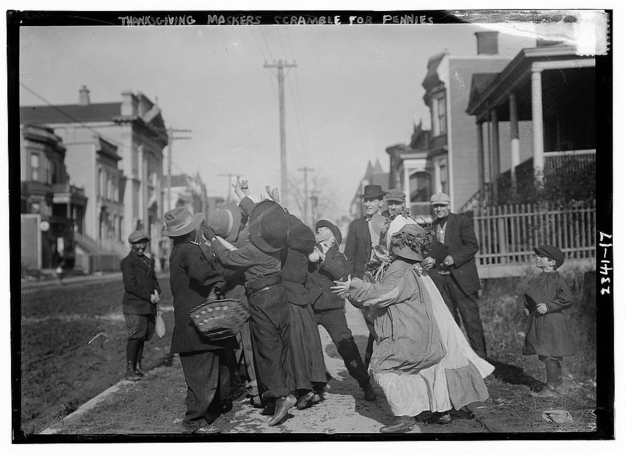 In 1911 charity workers advised people not to give to mummers or Thanksgiving beggars. 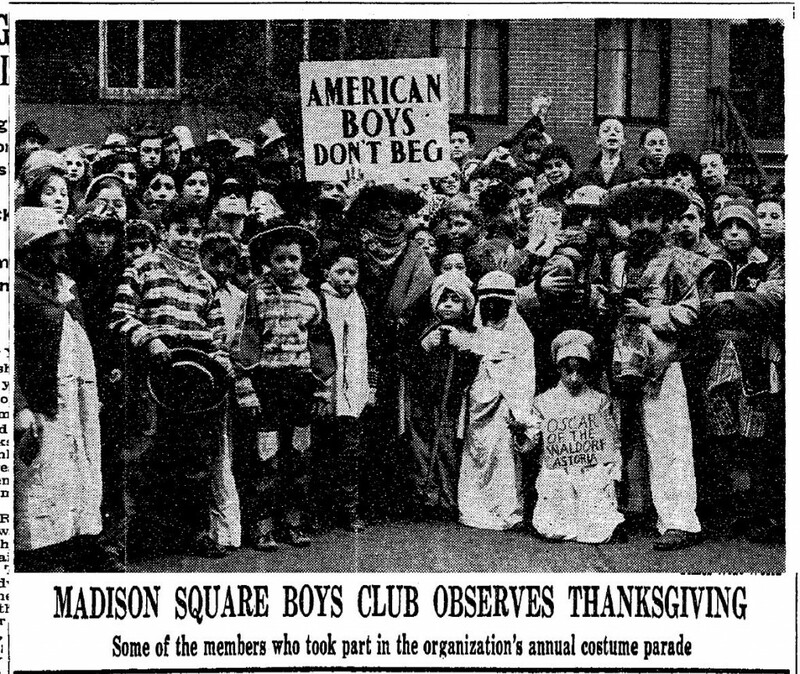 By 1923, an effort was made to organize the parades by a director of the Madison Square Boys Club to discourage the begging and mischief that often ensued. By 1940, that parade had grown in size to over 400 children and sported the slogan "American boys do not beg." 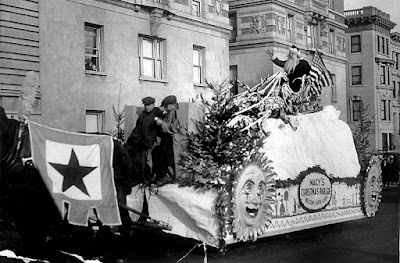 But in 1924, Manhattan’s Macy’s Department store followed the example of Gimbel’s in Philadelphia and planned an elaborate Christmas parade to be held on Thanksgiving Day. It’s purpose was to foster holiday shopping with employees parading as characters from their window displays, gigantic inflatable floats, and Santa Clause! Families flocked to watch the truly fantastic parade. In 1930, New York’s Superintendent of Schools publicly condemned the Thanksgiving begging and gained official public approval. With the low mood and financial hardship encountered during the depression, Thanksgiving mummery all but disappeared by the late 1930’s. A decade later, Ragamuffin traditions were ceded to the rise Halloween costuming which fostered the "begging" of candy again with a new mantra of “Trick-or-treat.” Thanksgiving was spared with an effort to promote the respected, family-centered holiday that we now enjoy. excluding 1944 & 1945, during WWII.